“Knife or scissors. Scissors or knife. The question was in my mind even before I knew it was there . . . .
“Knife wants steady. Ready, aim, chop. Scissors want strength. Powerful grip. Elbow grease. Clamp shut. Put your back into it. “Afterward, what? Blank, blank, blank. Blankety-blank. Fill in the blank. Soft as a blanket. “Knife or scissors? Scissors or knife? 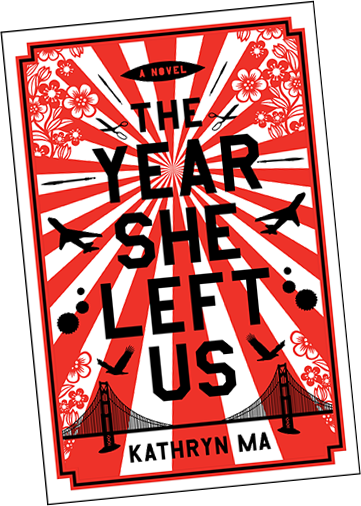 The Year She Left Us, Kathryn Ma’s debut novel, opens with eighteen-year old Ari hacking off her own finger in a hotel bathroom in China, her homeland. This dramatic opening sets the stage for Ari coming a bit undone – or, really, this act of grotesque self-mutilation is the culmination of her having come undone. Abandoned as a newborn in a department store in China, as many newborns, especially female newborns, are thanks to China’s one-baby law, Ari (as yet unnamed) is shuttled to an orphanage where she spends the first five months of her life before being adopted by an American woman. What makes Ari’s adoption unique, aside from the fact that the woman who adopts does so with no husband, is that her adoptive mother is also Chinese – by blood, anyway. She’s spend her entire life in America, her own mother having escaped China during the war. Ari is showered with love by her adoptive mother, as well as her grandmother and aunt – it’s nearly like having three mothers. But there is a hole in Ari that grows as she gets older, and the happy little girl grows into a sullen, morose, and angry teen. Who were her real parents? Why didn’t they love her enough to hang onto her? Throughout her childhood, her adoptive mother, wanting Ari to know and feel connected to her heritage, involves Ari in a playgroup/support group for Chinese adoptees, and a trip at the age of twelve to the town of her birth in China which includes a visit to her orphanage and, quite by accident, the department store where she was abandoned, prove to be a turning point for Ari – and not in a good way. Her feelings of loss and rootlessness grow; the questions of who she is, where and what she comes from, and where and to whom she belongs are monumental and unanswerable. Told from the alternating perspectives of Ari, her mother, her aunt, and her grandmother, the reader follows four women who each have secrets, regrets, and grief in their hearts. Charlie is a successful San Francisco lawyer who lost the love of her life shortly after she adopted Ari, and now she seems to be losing the daughter who has been at the center of her life for eighteen years. Les is a respected Judge in San Francisco, and both her career ambitions and her long-time affair with a married man have brought her disappointment. Gran, the matriarch, is both an intimidating and tender woman who sees into Ari’s heart more clearly than anyone else seems to. Ari’s odyssey to either find herself or make peace with the void that haunts her takes her from San Francisco to Seattle, to Alaska, and back to China where her story began. The characters and settings are vividly rendered, and the issue the story raises about the potential feelings of disconnectedness and aloneness by international adoptees is intriguing. Lisa, I believe this feeling of disconnectedness can be an issue for all adoptees, not just international adoptees. I am sensitive to it with my own, domestically adopted, son – and I hope we can help him navigate the gaps in his identity, which I am sure will surface more and more as he gets older. This book does sound like a great read. Also can overlap with feelings of children abandoned by one parent or death. This sounds like a powerful read. Thanks for being a part of the tour!